Pick up same day before 5:00 p.m. Call for info and to make an appointment. We follow the Tulsa Public Schools inclement weather closures. We appreciate as much notice as possible if you need to cancel or reschedule your appointment as we often have a waiting list of animals in need of our services. We have reserved a surgical slot for you. If you are not able to keep your appointment, please let us know ASAP. 1) If the animal normally stays outdoors overnight, he/she must stay indoors the evening before surgery. 2) Animals over four months old MUST have food withdrawn at midnight the night before surgery. This ensures that the animal's stomach is empty by the time he's put under general anesthesia. This lessens the chances that the animal will vomit and aspirate the vomit into his lungs. If your adult pet has eaten on the morning of surgery, we will refuse surgery. 3) Pediatric animals (4 months or younger) should have food available until 6:00AM on the morning of surgery. This helps to avoid decreased blood sugar level. 4) Water should not be withdrawn prior to surgery. 1) Check in time is 7:30-8:30. 2) We have a very strict surgical schedule that must be followed. It is very important that you arrive on time. If you are late we may need to re-schedule your appointment. 3) Plan to be here 30 minutes in the morning. 4) You must complete the necessary admission form when you arrive. You may stop by the clinic prior to you pet's scheduled surgery day and pick up paperwork to save time the morning of your appointment. Please note that in the rare event of unforeseen circumstances or emergencies at the clinic there may be a longer wait at check-in or your pet’s surgery may need to be rescheduled. 1) Our veterinarian will perform a pre-operative physical examination to make sure that your pet is a good candidate for surgery. 2) If your pet is too fractious to handle, a physical exam will be performed under anesthesia. 3) Feral cats receive their physical exams under anesthesia. 4) If your pet shows signs of illness or if there are any concerns (such as age, a heart murmur, severe upper respiratory infection, obesity, food in stomach) we may refuse surgery if we feel surgery is a health risk. 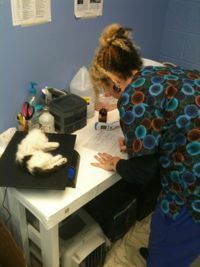 5) Our clinic is designed to accept healthy animals for spay and neuter surgeries. If your pet has underlying health problems, the surgery should be performed at a full service vet clinic. If your pet has not been feeling well, it is best to reschedule the surgery for a later date. 1) You must pay for services at check-in. We accept cash, credit or debit card (no personal check). 2) You must bring your cat in a clean pet carrier. 3) Do not put multiple cats in one carrier. Your pet needs to be able to lie down comfortably in the carrier after surgery. Your pet may be agitated or aggressive when they go home due to the after-effects of anesthesia. Cats that routinely get along well may not be tolerant of each other in the immediate post-operative period. 4) If you have multiple cats in one carrier when you arrive, you will be asked to transfer your cat(s) to one of our cardboard carriers to go home ($5.00 each). 5) If you are bringing a feral cat in a trap you must bring in an extra carrier for the cat to go in after surgery. 2) Dogs must be under control on a leash or in a clean pet carrier. 3) If your dog is not good-natured around other dogs, cats or people a muzzle is required. 4) Please take your dog for walk before you arrive as he/she will be in a kennel all day. Spay Oklahoma is registered as a 501(c)3 not-for-profit organization, founded in 2004.